We aren’t ashamed to say it: we have invested heavily in developing the best e-paper based digital bus stop display technology available. We have not stopped innovating since we launched in 2016, in fact since we made this announcement last year we have done so much more to enhance the Papercast solution in our mission to remain at the forefront of passenger information display technology. But there is more to a great solution than the display technology. Nearly three years ago we developed the very first release of our Content Management System, but our engineers can’t help themselves. They have been improving it ever since. 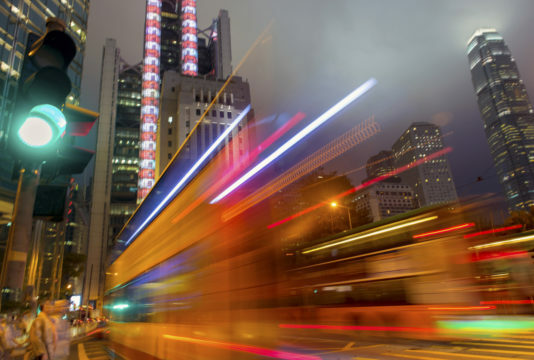 Developed specifically to meet the needs of transit authorities and enhanced by ongoing user experience studies, the Papercast Content Management system offers some of the most advanced functionality you will find on the market. 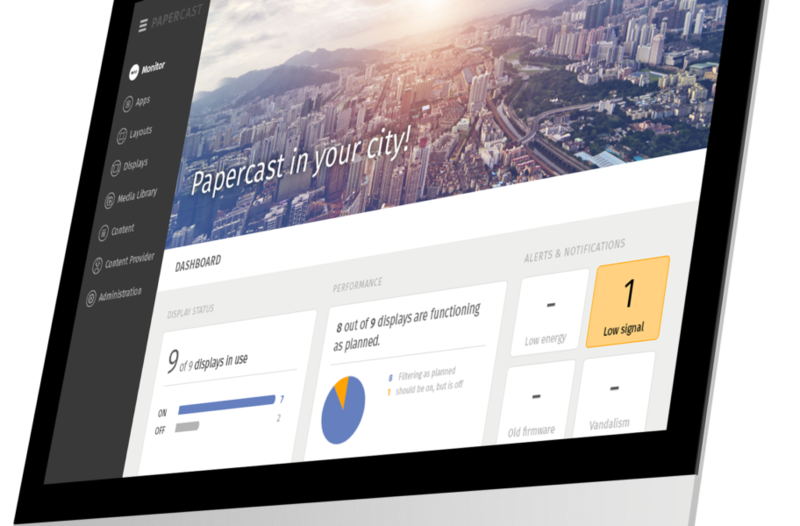 Our user-friendly cloud-based platform can be accessed from anywhere and is packed with features to enable you to manage every aspect of your Papercast e-paper displays. We demonstrate the system frequently and it is becoming increasingly apparent that its functionality is ahead of the game. In this blog, we share six of the many highlights. If you want to see it for yourself, contact us about a demo. Monitor every aspect of every display on your network through a highly visual, interactive dashboard. 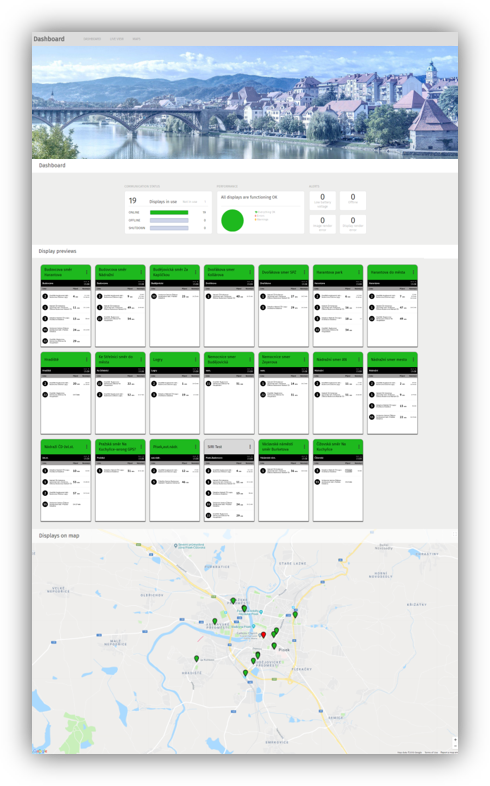 In a single view, you can see a summary of display status, performance, alerts and notifications across the network for an instant operational view. 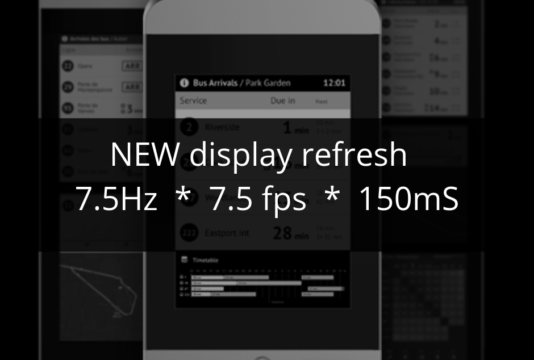 With a user defined variable refresh rate, previews of each display give you the same information that the traveller is seeing at the bus stop. A city map shows the exact location of each display with a colour marker to denote the status, you can click on each marker for full details. Users can organise the layout to suit, with functions such as filter, sort, add, show and hide. You can even set your own banner image for a truly customised interface! Once an app is installed from the Paperstore, its widgets are available for adding to your layouts. 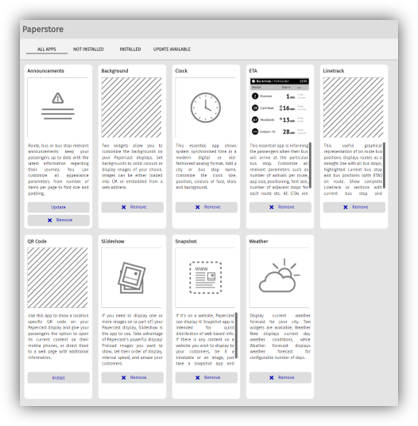 You can create content layouts for each display size, configuration and orientation. One layout can be assigned to a display configuration at a time, while a layout can be assigned to multiple display configurations. The schedule function allows you to define what layout will be shown on the display and when. This is useful if you want a different layout for daytime and evening or weekday and weekend. You can have multiple schedules for each layout, you can also have multiple layout states which can change as defined in your schedule. Are you following? You can choose the content that is shown in the layout during the defined periods. Called states, each state represents a specific page displayed on the screen for the scheduled period. This is where your widgets come into play! You can select which ones you want to use, drop them in the right position and adjust the size to suit. What if your display is in offline mode? Well, we’ve thought of that too. With offline rendering available you can show useful information, such as a static timetable, when the display isn’t receiving live data. Every Papercast display communicates with the Papercast Management System via a built-in controller that is configured before the display is supplied to the customer. Via the controller you can control all operational aspects of the display. During set-up, you can define the display configuration, assign the display to a bus stop and add a bus stop to the system. Once operational you can customise power consumption and power mode behaviour, define the partial and full update frequency, manage shutdown and activity periods and set LED illumination settings. Alerts are notifications about display condition, operation or performance. You can decide which alerts you want to be activated, the alert conditions and how, when and who you want to be notified, by text, email or via the dashboard. There are alerts for low battery voltage, display offline, image render error, display render error, temperature and humidity levels. All active and resolved alerts are logged in a single view for easy management. If there is a problem, you will know about it and can quickly take necessary action. Finally, we’ve added full administrative functions that you would expect from any management system – adding new users, defining privileges and alert preferences. We promise you, our management system never fails to impress. If you would like to see it for yourself then arrange a demo or contact us to find out more.